Will someone please give me a instruction book? but little guidance on how everything worked. For example, there is a large center section where diners stand at tall tables and can enjoy cheese, salumi and wine. The place was pretty packed, but I managed to find a table spot. I waited a while, but no one came by to take my order, so I walked around – perhaps it was a cash and carry dealio. However, I couldn’t determine where to order the food. Then I found a few paper menus strewn on some tables – so maybe someone was supposed to take your order after all? I determined what I wanted from the menu, and once again – tried to find out if someone was supposed to take my order I asked around, but no one knew. After about 15 minutes, I gave up and left. I then tried to get a seat at the pizza bar. The wait was 2.5 hours (which I wasn’t too keen on), but I was told I could enjoy some wine and walk around. Again, if I knew how the beverage ordering system worked, I’d consider it. Boo. 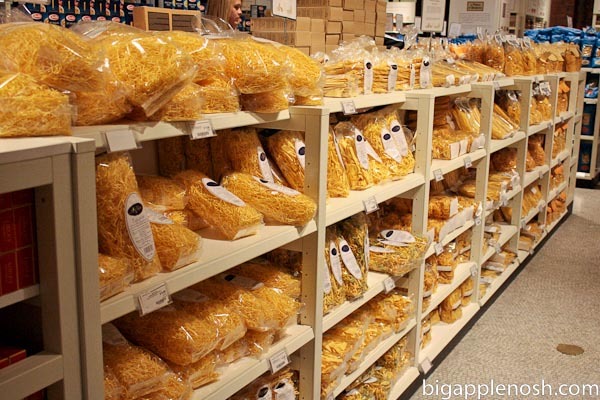 There was a noticeable price premium – if I were getting typical dried linguine, I’d probably purchase it elsewhere. 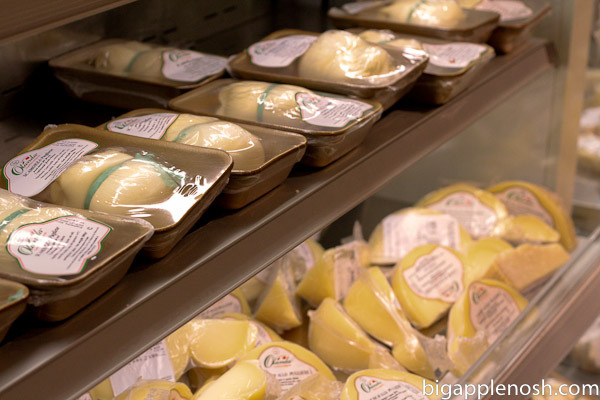 However, Eataly did have a good selection of harder-to-find ingredients, which was nice. In the end, I left without buying or eating anything – Eataly is relatively new in NYC, so hopefully the experience will improve later on. However, I found it too unorganized and not user-friendly to make for an enjoyable experience. I’m holding off on a rating until I can visit it again. …and I wanted to leave some feedback. But the comment cards were at the entrance, and not the exit. How does that make sense? I wasn’t about to loop around again, but if they really want feedback wouldn’t it be more prudent to leave the comment cards at the exit? Boo. thanks for the honest review. 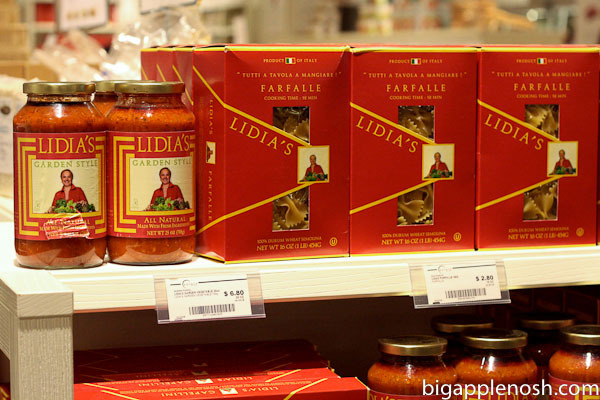 i feel like i've heard some similar things about eataly. i could not agree more. we were there on saturday and while it was fascinating and fun, i ended up more frustrated by the disorganization and crowds than anything else. i'd be willing to go again after all the hype dies down to give it another shot. i am curious to know if it's any better on a random weekday at an off hour rather than on the saturday after thanksgiving in the middle of the afternoon, which was of course the only time we could go. Aw, boo. Seems like such a good concept if they can just get the logistics down. 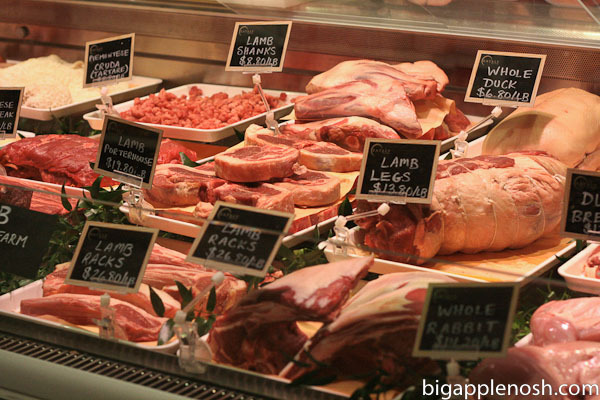 And I would love to go there or a shop like it for hard-to-find ingredients if it wasn't so disorganized. Too bad about all the confusion! I still have only walked through a few times and not actually bought anything there. It's amazing to me that it is still so crowded and busy there. sounds intimidating! what a frustrating experience not being able to enjoy the good eats there! haha this sounds like quite an adventure. I love the name though, Eataly, so clever. 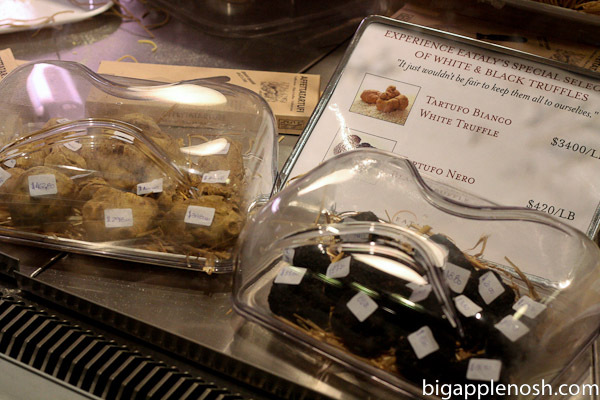 and OMG those truffles are ridiculously expensive but I've never seen whole truffles in the flesh so lucky you! Darn, that is too bad that the store is so confusing…because it sounds like it has the potential to be amazingn! Booo…..
How disappointing 🙁 I really want to be excited to visit Eatly, but I've read some similar reviews. 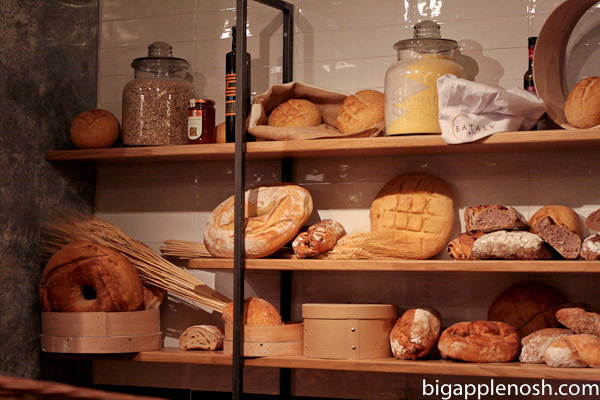 ZERO apples for Eataly. Sounds like it could be an awesome place, I'm sorry it wasn't a good experience. Hope they improve soon! Deadly accurate answer. You’ve hit the bulleeys! It sounds like one of those places where, you want help, but the place is too pretentious to ask without feeling stupid. I hate places like that! It's so uncomfortable! 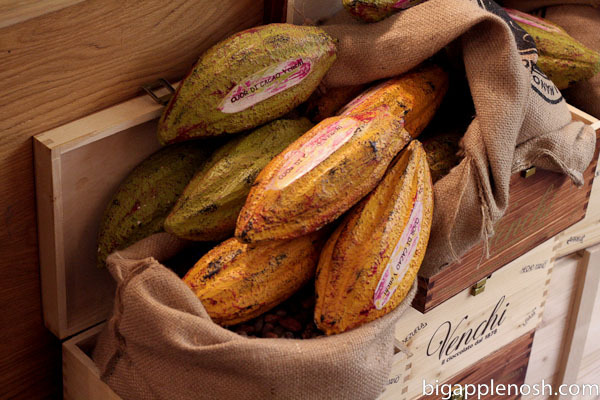 Oh, and I totally just died at the price of those truffles, HOLY CRAP!!! Always the best content from these priidgoous writers. 100% agree with you on everything. Totally disappointed in this place. Also, FYI, when you and Christina were over for dinner, I used fresh white truffle from Eataly. They weren't that fresh at all. That's too bad! I'd heard about this place and also wanted to check it out. I think I'll follow your lead and wait until it gets less crowded, whenever that will be! Eek. Too bad it wasn't a good experience – the concept sounds pretty fun. That's so weird that the comment box is at the entrance… maybe they really don't want the feedback they're probably going to get at this point! 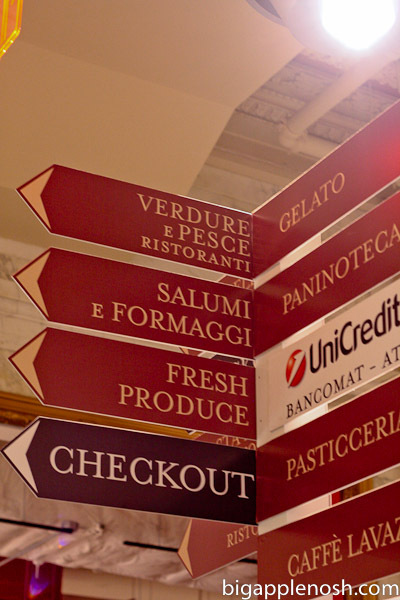 It sounds like everyone would need a guide in Eataly! I agree, the comment cards should come at the exit…it would be like giving someone a comment card before they eat a meal at a restaurant! 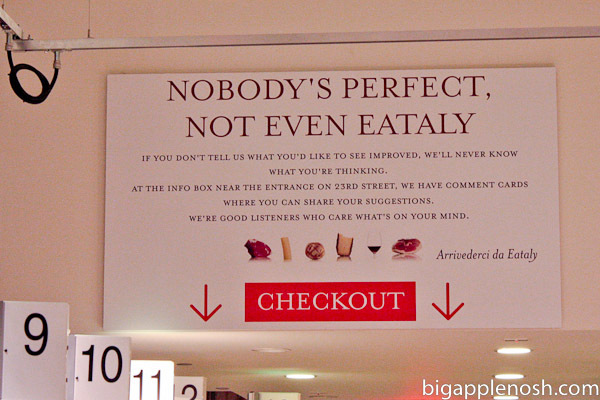 Maybe someone at Eataly will read your blog post. I felt the same way when I went there. Although to be fair they had just opened 2 days before when I went and it was chaos! My friend and I were able to eat at the pizza bar, although the pizza was good and the wine delicious, I'm going to have to say that I've had better… It's a fun experience though.
) I care for such info much. I was seeking this certain information for a very long time. You cann’t consider just how so much time I had spent for this information! I’d love to write some articles for your blog in exchange for a link backk to mine. Please send mme an email if interested. Many thanks! Hey there. Have you figured out how you can make a website cell phone warm and friendly? I’m looking for a motif or plugin that could possibly handle this problem. If you have any suggestions, please share. Easy dilemma that’s completely from area. My web site appearances creepy when exploring. usability and visual appearance. I must say you’ve done a fantastic job with this. Whaat web hkst are youu the use of? Can I am getting your affilite link in your host? High-quality and enduring plumbing and service options. If you have limited budget, then cost holds a great importance. The third image below is a warning from Vista that it can’t verify the “publisher of this driver software. delighted I discovered it and I’ll be book-marking it and checking back regularly! find out how you center yourself annd clear your mind bfore writing. usually lost simply just trying to figure out how to begin. Any ideas or tips? am waiting for your further post thank you once again. going to a well-known blogger when you aren’t already.